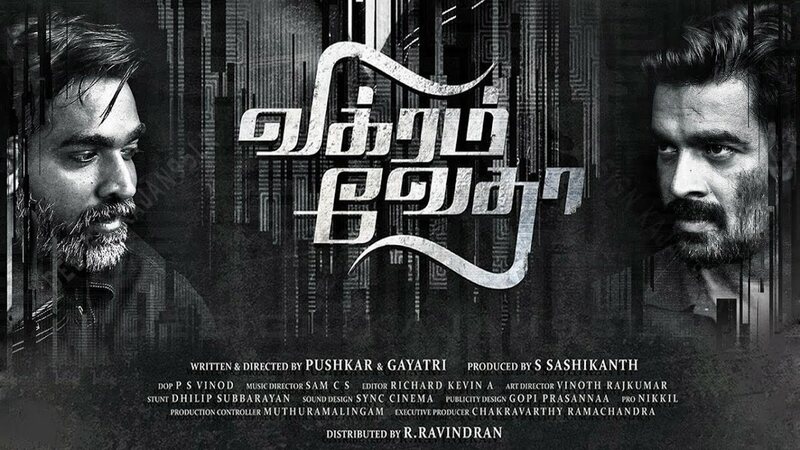 Vikram vedha is the 2017 tamil movie, written and directed by Pushkar and Gayatri under the banner of ‘Y Not Studios’. The cinematography of P S Vinod and the seamless editing by Richard Kevin gives the movie a vivid cinematic experience. BGM by Sam C.S is another vital element that makes you clinged to the movie . The film boast of a well celebrated star cast which include Madavan and Vijay Sethupathi in the lead and other pivotal roles are done by Shraddha Srinath, Varalakshmi and Karthir. We have seen gangster movie and police movies, but VikramVedha is both worlds in one. The movie unravels through Vikram who is a police officer and head of covet unit which was formed to bring down a mob run by Vedha. The movie starts with a police encounter lead by Vikram and his colleague Simon with their team on the building which was tipped by an informant which could possibly give information about Vedha. Every goon gets killed in the encounter. But soon after it, Vedha surfaces from his cover. As the police plan to raid the place; to their surprise Vedha himself surrenders to them. The interrogation was a total failure until Vikram steps in and all Vedha wanted was to tell him a story about himself and nothing else. This was judge things not as a police officer but from his point of view. Half heartedly Vikram finally listens to what Vedha wants to say and there starts the story of how a henchman become gangster to what he is now. The movie is not just a flash back of Vedha’s life, but of relationship, revenge and brotherhood. The story telling way of the movie is something different that we had seen in the past. Vedha reveals three stories in different times of the films which connect all the dots in the movie. The film has all the charm of a police movie and the furiousness of a gangster movie. With all action, drama and love it has the perfect blend of commercial cinema. Like all the new generation films; VikramVedha also has many twists and turns that prove that our guesses were all wrong at the end. What to watch for; is the plot and the performances from Vijay Sethupathi and Madhavan. Vijay Sethupathi is at his best and should have a big round of applause for his character transform in the film which is splendid to watch. Other positive factor of the film is its finely blended BGM which keeps on ringing on our ears even after the movie is over. To conclude Vikram Vedha is a very good entertainer and is a must watch for all movie goers.